It’s time for a feelgood story. Say HELLO to Monifa. 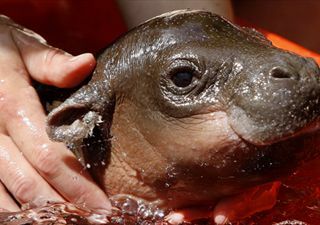 She is a rare pygmy hippopotamus born a few weeks ago in Sydney’s Taronga Zoo. Click here to read about her. When you have clicked on the link you must check out the video within the story because little Monifa is having a bath in it. She is the cuteness, isn’t she? I can’t wait to go and see her. Well, wouldn’t you know it? I was hoping to see pygmy hippos on the Gambia River in 1999, but saw never a one. And, I could have seen them in Sydney! You know, I’ve never seen a baby hippo! How cute is that??? She’s a doll. 🙂 Our local zoo is shut down for winter. I miss year round zoos (which I know ya’ll are experiencing spring/summer aren’t you?). But I understand why they do it here – it’s just too cold for humans and animals alike. What a sweet little punkin! Look at those lil’ ears. It looks like she’s smiling. She’s just precious. Thank you for the pics. A gold star for cuteness. Oh, jeeeeeze… is it wrong of me to want one? TRAVELRAT – to see them in the wild would be such a treat. Next time I go to the zoo I’ll get some shots of Monifa. My son is in love with her so no doubt we’ll be there all day once her exhibit opens! CRAFTY GREEN – does it? I hadn’t realised. Aren’t they the most adorable wee things? NAT – I also love hippos but I saw a David Attenborough special and he said the larger ones have such powerful jaws they could rip your head clean off with one swipe. Don’t mess with the hippo! HILLY – can you believe it? I am in love!!! TEXASBLU – she is a cutie-pie. Our zoo stays open all year but then our winters don’t really get that cold and of course, it doesn’t snow. I do love visiting the zoo. It is perched on Sydney Harbour so it is very picturesque! EPIPHANY – I can’t get over the ears. Nick and I have watched the video about 20 times. We are baby animal nuts. We go ‘awwwww’ and ‘aaaaahhh’ in exactly the same places each time. You’ve started something. Nick wants to call her ‘Little Punkin’ now. PUNATIK – a whole row of gold stars!!!!! PAUL – I would love to hug that hippo! KAREN – oh, me too. I couldn’t provide the right habitat but can you imagine seeing that sweet face every day? Looks like I’ll have to renew my zoo membership! I heard somewhere or other (probably a David Attenborough special) that hippos kill more people than lions, tigers, crocs etc because people are wary and scared of those creatures whereas they see hippos as being big and fat and sort of goofy and slow…and then it’s CHOMP! 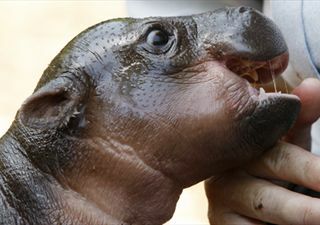 that pygmy hippo is epithoppome of cute. What is it with you and GOLD STARS??!! This is a lovely post so I am going to award you a GOLD STAR too. I guess that means that you have 4 now! Awwwwwwwww! I also loved the little ear flicks in the bath tub. Too gorgeous. Yes, David, in Africa the big hippos are the most dangerous animal. You must NEVER get between them and their water. I’ve seen them up in the Okavango -they’re scary guys. Not of course like this lovely little thing. Funny Selma, they had a news story on South African news about this very fellow just last night! A small point of information: My surname Kubuitsile means The hippo has arrived in Setswana. Many people who know me call me MmaKubu (Mrs. Hippo) HA! these photos are super adorable. DAVID – I have heard that too. They are incredibly powerful animals. CHRIS – I missed out on a lot of gold stars as a kid. I was constantly pipped at the post by my arch rival Louise Atkinson – a goody two shoes if ever there was one. Now I crave gold stars. I think I need help! DAOINE – aren’t the ear flicks the cutest thing? I could just hug that little darling. LAURI – I had no idea that was the meaning of your surname. Oh, that is utterly charming. I absolutely love it! MELEAH – I can’t stop looking at them. There is something about baby animals I just can’t resist! Well I’ll join the too cute for school club. What a delightful little creature and how about having the job of being the surrogate mother? That would be awesome. ROMANY ANGEL – how many people are going to put up their hand for surrogate mother? LOL. What a cutie-pie! I dunno Selma, hippos can be aggressive animals. Sure she looks cute now but when she grows up she can attack. She will be a hippocrite!! lol. All silliness aside, she looks like a cutie. ROSHAN – that little sweetums will never attack (I hope). I know some of the laerger hippos can be quite aggressive, though, so I suppose you never know. Oh, I just love her!